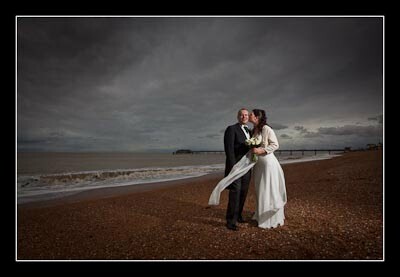 I had the pleasure of photographing Susannah and Paul's wedding in Deal on Wednesday afternoon. The weather was stormy and windy but, remarkably, the rain held off for the 3.5 hours I was with them. In return though we had a wonderfully dramatic sky. The ceremony was held at Deal Town Hall (which is magnificent) and then we wandered along the beach and on to the pier for a reception at Jasin's restaurant. Susannah and Paul are made of stern stuff and no adverse weather conditions were going to spoil their fun. Their exit from the beach was particularly memorable! I love this photo... maybe a little 'bleak' for some, but for me its very powerful and very romantic.